FREE Samples: Vanier Engineered Hardwood - LongHorn Collection Arizona / Oak / Wirebrushed / Builders Grade / 7 1/2"
Arizona / Oak / Wirebrushed / Builders Grade / 7 1/2"
25 year warranty: each purchase is backed by 25 year finish and structural warranties in residential spaces, and an 8 year warranty in commercial spaces. Solis European Oak Collection - Tiger's Eye / French Oak / Brushed / 7 1/2"
Luna European Oak Collection - Gunstock / French Oak / Brushed / 7 1/2"
Luna European Oak Collection - Twilight / French Oak / Brushed / 7 1/2"
Luna European Oak Collection - Kodiak Brown / French Oak / Brushed / 7 1/2"
We love our flooring! Product matches the samples we received and the images online are accurate representations of what to expect. Unlike most engineered flooring at this price point there was actually far more full length planks than shorter ones in each box which was great. There is a lot of variation in shade and in knotting, and yes the knots are filled with gray putty. 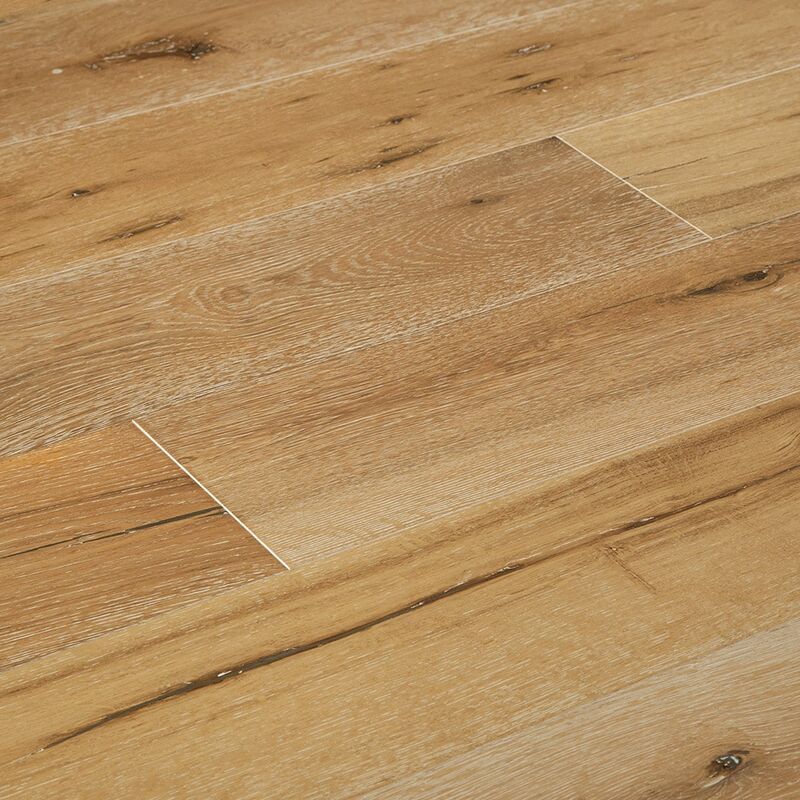 However, once an "uglier" plank is laid and among the other planks, it all blends in to make a uniformly beautiful floor. Shipping cost from CA to the East coast was our biggest peeve. Even buying in bulk we had no way of getting this huge cost lowered and in the end was almost too much for us to go forward with purchase. Let me start by saying I love this floor. However, there are some things to know so you know what to expect....The putty in the knots is grey. Which I knew from reading the reviews. I like it as it makes it feel a little more modern and less rustic. It has a lot of knots so don't expect a lot of clear boards but I think the price point would make you know that. I LOVE the way it looks, warm yet modern! I have built/remodeled many homes and no it isn't the best quality flooring but it is better then most big box engineered flooring. All while coming in at half the cost and well worth the price. I just hope it holds up well! Time will tell. Also, the boards are decent lengths, I was worried it would be a bunch of small pieces but they were good lengths! I will definitely be buying again. The sample we received was very nice. We ordered based on that, because the color was perfect for our beach cottage, and there was a 3mil layer of wood on top, which is more than some of the other samples we'd seen in our research. The product arrived on time, as advertised. However there were many planks with gray putty in the holes, which took on a totally different feel than the sample we were given. It's not terrible now that our floor has been laid, but just wasn't represented in the sample. I would recommend that the company consider this when shipping samples in the future, so there are no surprises.